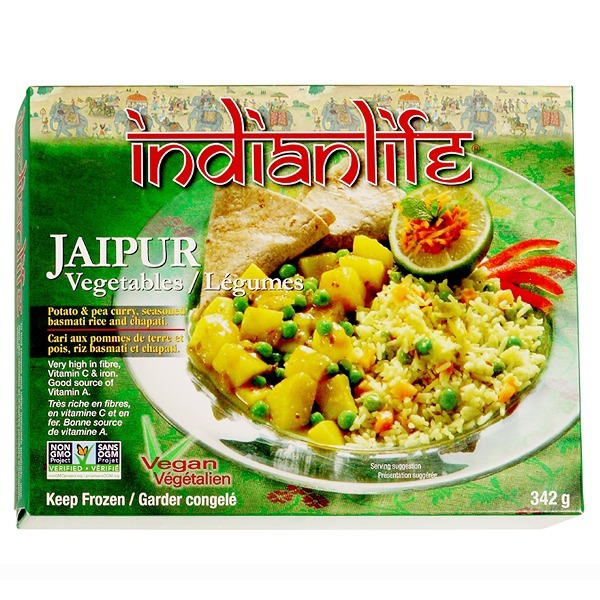 Jaipur Vegetables – Potato/Pea Curry Entrée – IndianLife Foods Inc.
A compete vegetarian meal in minutes! 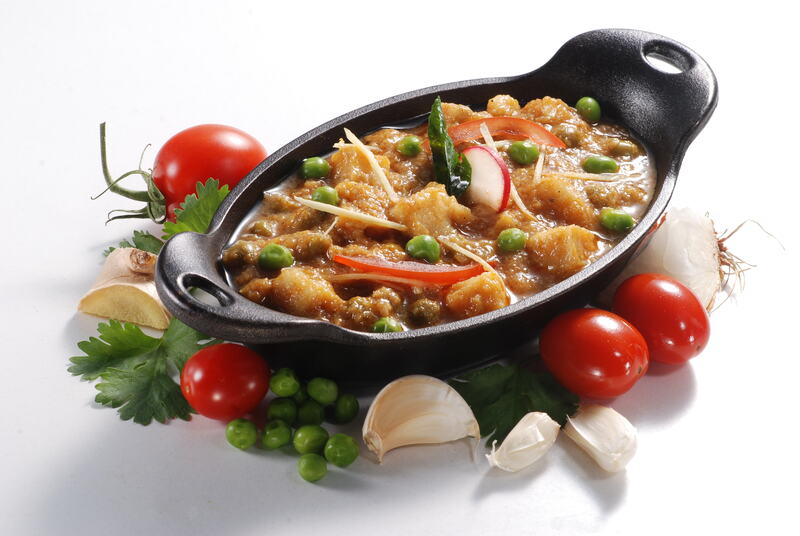 Fresh potatoes and green peas blended with onions, tomatoes and our signature spices. 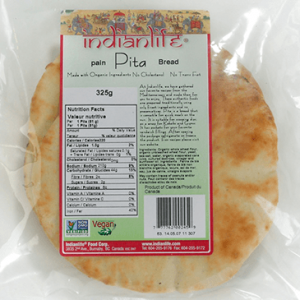 Served with traditional vegetable rice and our organic whole-wheat chapati. CURRY: Potato, Peas, Water, Onion, Garlic, Green Chilies, Ginger, Tomatoes, Salt, Cilantro, sunflower Oil, Herbs and Spices. RICE: Rice, Green Peas, Carrots, Onions, Green Chilies, Ginger, Salt, sunflower Oil, Herbs and Spices. CHAPATI: 100% Organic Whole Wheat, Water, sunflower Oil, Salt. Cook from frozen. For best results, use microwave. Individual ovens vary; these are guidelines only. Not recommended for toaster ovens. Microwave (1000 watts): 1. Separate chapati from meal 2. Make 2 to 3 small slits in film over the curry portion for steam to escape. 3. Microwave on HIGH for 5  6 minutes. Tray will be hot; use caution and support when removing from microwave. 4. Peel back film over the meal, stir curry and rice and let stand for 1 minute. 5. Remove film from chapati and microwave for 20-40 seconds. 6. Enjoy your authentic Indian Meal! Conventional Oven Preheat oven to 375°F (190 °C). 1. Separate chapati from meal 2. Make 2 to 3 small slits in film over the curry portion for steam to escape. 3. Place tray on a baking sheet and bake on middle rack of the oven for 20  25 min. Stir the rice half way through cooking time. Tray will be hot; use caution and support when removing from oven. 4. Peel back film stir curry portion and stir, let stand for 1 min. 5. 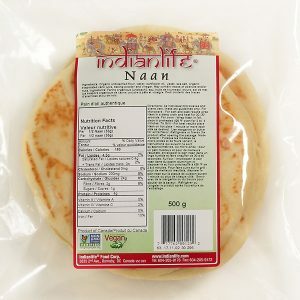 Remove film from chapati and place on baking sheet and bake on middle rack for 4 – 5 minutes or heat on a hot plate for 1 minute or more each side as desired. 6. Enjoy your authentic Indian meal! Cook from frozen. For best results, use microwave. Individual ovens vary; these are guidelines only. Not recommended for toaster ovens. Microwave (1000 watts): 1. Separate chapati from meal 2. Make 2 to 3 small slits in film over the curry portion for steam to escape. 3. Microwave on HIGH for 5  6 minutes. Tray will be hot; use caution and support when removing from microwave. 4. Peel back film over the meal, stir curry and rice and let stand for 1 minute. 5. Remove film from chapati and microwave for 20-40 seconds. 6. Enjoy your authentic Indian Meal! Conventional Oven Preheat oven to 375°F (190 °C). 1. Separate chapati from meal 2. Make 2 to 3 small slits in film over the curry portion for steam to escape. 3. Place tray on a baking sheet and bake on middle rack of the oven for 20  25 min. Stir the rice half way through cooking time. Tray will be hot; use caution and support when removing from oven. 4. Peel back film stir curry portion and stir, let stand for 1 min. 5. Remove film from chapati and place on baking sheet and bake on middle rack for 4 - 5 minutes or heat on a hot plate for 1 minute or more each side as desired. 6. 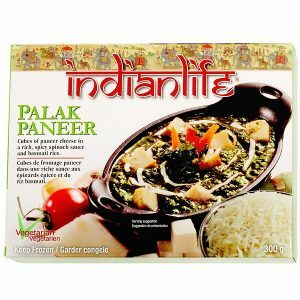 Enjoy your authentic Indian meal! CURRY: Potato, Peas, Water, Onion, Garlic, Green Chilies, Ginger, Tomatoes, Salt, Cilantro, sunflower Oil, Herbs and Spices. RICE: Rice, Green Peas, Carrots, Onions, Green Chilies, Ginger, Salt, sunflower Oil, Herbs and Spices. CHAPATI: 100% Organic Whole Wheat, Water, sunflower Oil, Salt. PICKLE: Lime, Salt, sunflower Oil, Herbs and Spices.